10 interview tips to boost your chances of landing the job. The day has come: You found an awesome job on Monster, applied, and got a call from a real-live human being who wants to meet with you. Congrats! But your work has only just begun. Even the smartest and most qualified job seekers need to prepare for their job interview. Why, you ask? Interview skills are learned, and there are no second chances to make a great first impression. These 10 interview tips will teach you how to answer interview questions and convince the hiring manager that you are the one for the job. 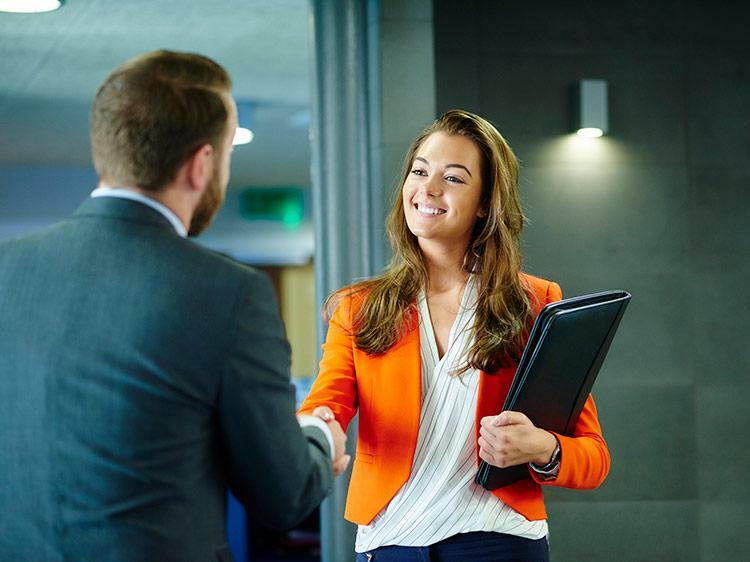 It's about demonstrating confidence: standing straight, making eye contact and connecting with a firm handshake. That first nonverbal impression can be a great beginning—or quick ending—to your interview. It's a given that you should use professional language during the interview. Be aware of any inappropriate slang words or references to age, race, religion, politics, or sexual orientation—these topics could send you out the door very quickly. Attitude plays a key role in your interview success. There is a fine balance between confidence, professionalism, and modesty. Even if you're putting on a performance to demonstrate your ability, overconfidence is as bad, if not worse, as being too reserved. When you interview with the "please, please hire me" approach, you appear desperate and less confident. Reflect the three Cs during the interview: cool, calm, and confident. You know you can do the job; make sure the interviewer believes you can, too. One way to do this is by preparing well-thought-out answers to questions they're most likely to ask. Need some help with that? Join Monster for free today. As a member, you'll get interview insights, career advice, and job search tips sent directly to your inbox so you can come across as a strong, viable candidate. From ice breakers ("Tell me about yourself") to the nitty-gritty ("What's your biggest weakness? "), Monster's expert advice can help you craft answers that highlight your skills and eagerness to get the job.